Half-hardy evergreen tree with leathery, sharply-pointed, yellowish leaves, scattered or two-ranked, to 2.5cm long, and reddish fruit. To about 20m. [RHSD, Hortus, Hilliers']. 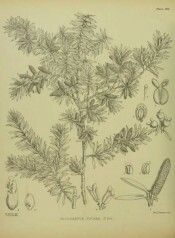 ‘Although the totara is found throughout the whole length of both the North and South Islands, there is no evidence to show that it was observed by the earlier botanists who visited New Zealand— as Banks and Solander, Forster, Menzies, &c. The first reference I can find — and that a bare mention of the name — is in Nicholas's "New Zealand," published in 1817. The first botanist under whose notice it came was the talented and enthusiastic Allan Cunningham, who gathered it during his first visit to New Zealand, in the year 1826. His diagnosis of the species, published in 1838 in the well-known "Precursor," was the earliest scientific description to appear; but the name Podocarpus Totara had been previously applied by D. Don in the second edition of Lambert's "Pinetum," issued in 1832. Don's name, and his remarks respecting the plant, were based on information supplied by Dr. George Bennett, of Sydney, who visited New Zealand in 1829, and who not only formed botanical collections of some importance, but who also gathered a considerable amount of information respecting the natural history of the country and its Maori inhabitants.’ [Illustrations of the New Zealand Flora. Cheeseman. p.266/1914]. Listed in the 1850 and 1857 catalogues [C.86/1850]. But see also Podocarpus australis Hort.